Model T Ford Forum: Montier-Fords - at las the book is here! Montier-Fords - at las the book is here! Model T Ford Forum: Forum 2013: Montier-Fords - at las the book is here! Most of us tend to think that Fords did not play much of a part at Le Mans until the early 1960s. But that is not quite the case. 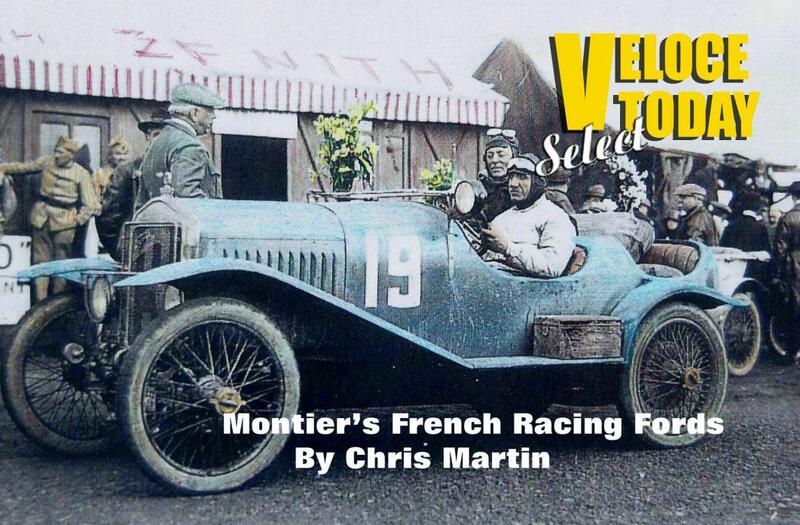 Charles Montier, a French Ford dealer, (called “Le Sorcier” by the locals long before Gordini) entered the famous endurance race in 1923, 1924 and 1925. Few people even realize that a Model T Ford not only raced in that grueling event (won by a Chenard Walcker) but finished in 14th place in the first ever 24 hours of Le Mans. But the Montier-Fords were just getting a start; amazingly, by the 1930s Montier-Fords would participate in a number of Grand Prix events, racing against Alfa Romeo, Mercedes Benz and Bugatti. Charles Montier was the son of a blacksmith in rural France. While still in his teens, he helped his father build a steam powered wagon that scared the locals. From there he moved to Paris and on to a varied career in the burgeoning French motor car world including a spell building racers for Darracq, ultimately setting up his own business based around selling, modifying and racing Fords. Encouraged by his efforts at Le Mans, Montier kept up the development of his Ford based racers and appeared at many events throughout France and Belgium and even made occasional forays to Grands Prix as far away as Spain and Morocco. Joined later by his son Ferdinand, the Montier team often fielded two cars and even sold a few to amateur racer customers. Montier’s career had many ups and downs and side projects that all serve to show the combination of determination and engineering skill that possibly deserve more recognition than he currently enjoys. He raced against some of the greats of the day, often gaining class victories, and such names as Tazio Nuvolari, and Albert Divo, Giovanni Agnelli, and the King of Spain all are part of the Montier’s story. The car that ran at the first Le Mans 24 has been restored in France and has made appearances in recent years at the Le Mans Classic event surprising all who had thought that Ford’s participation in the famous ‘Vingt-Quatre Heures du Mans’ had started with the legendary GT40! Parts of this story have been told in French publications over the years but little was ever written about his exploits in English. In addition, this VeloceToday Select Folio includes period photos and a complete listing of all races, hillclimbs, and Grands Prix entered by the Montier-Fords from 1921-1934. A 32 page ‘Folio’ landscape format booklet measuring 8 1/2 by 5 1/2 it is published by VeloceToday and available from the author (c’est moi) for US$20 including postage to anywhere. Send an email to; cmscarstuff@bigpond.com and I will forward a Paypal invoice that enables you to pay securely by credit card.